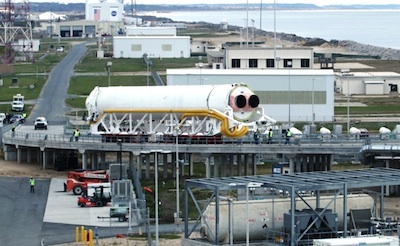 Orbital Sciences Corp. rolled the first stage of its Antares rocket to the launch pad Wednesday for several days of pathfinder tests and fit checks, a key step before the booster's debut flight this summer. The Antares rocket will launch as soon as July on a demonstration flight before commencing cargo delivery services to the International Space Station later this year. Construction of the Antares launch pad at NASA's Wallops Flight Facility on Virginia's Eastern Shore was delayed by difficulties with the facility's liquid propellant fueling and pressurization systems. The launch pad rework delayed the Antares rocket's first flight from last year until the middle of 2012. No other Wallops launch pad or Orbital Sciences rocket uses liquid propellant systems. With the launch pad work and certification nearly complete, engineers rolled the Antares first stage from its horizontal integration facility to launch pad 0A on Wednesday. It will stay the pad several days as workers verify the rocket and launch pad interfaces line up as designed. 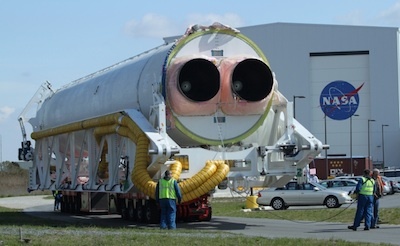 The rocket was attached to the Antares transporter-erector for the one-mile rollout. The seaside launch pad is owned by the Virginia Commercial Space Flight Authority, a state agency created in 1995. The launch pad lies on NASA property. The Antares first stage is powered by two kerosene-fueled AJ26 engines provided by Aerojet. The company converted Russian NK-33 engines into an AJ26 engine by removing some harnessing, adding U.S. electronics, qualifying it for U.S. propellants, and modifying the system to gimbal for steering. After the fit checks, workers will move the rocket back to the hangar for more processing before transferring the booster to the launch pad again for a 30-second hotfire of the AJ26 engines. 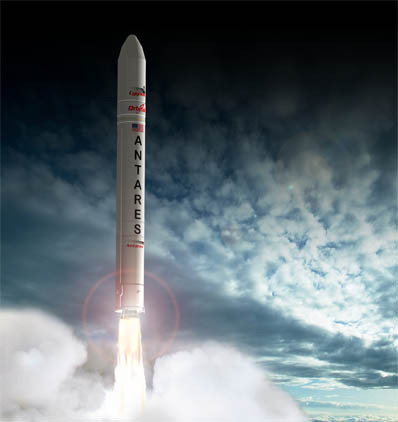 Artist's concept of an Antares rocket. Credit: Orbital Sciences Corp. The Antares rocket and Cygnus cargo freighter are booked for eight operational flights to the space station under a $1.9 billion Commercial Resupply Services contract with NASA. NASA tapped SpaceX for 12 cargo delivery missions with its Falcon 9 booster and Dragon capsule in a $1.6 billion agreement. SpaceX will launch its space station resupply flights from Cape Canaveral Air Force Station, Fla.